SLIM REFLEX is an automatic scanning “O” frame to measure in reflection mode. 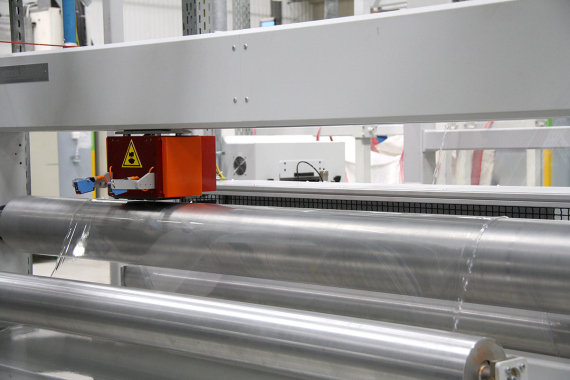 A reference-roll, on which the material is supported, is part of the scanner. SLIM REFLWEX is particularly light and compact. For this reason it is an ideal device for any industrial applications where there is a requirement for limited space and weight. Moreover in case of particular requirements (for example, low material tensions or minimum winding angle) the reference roll can be motorized or synchronized with the production line speed. Category: Scanners. Tags: Composites, Rubber, Sheets & foils. SLIM REFLEX has an integrated and innovative structure using a unique combination of stainless steel tubular panels and terminals. Because it is compact, it can easily be integrated with existing processes. During the scanning phase, the sensor is driven by linear guides with limited supporting elements and sliding sleeves. The scanning speed is adjustable and the sensor is position with high accuracy.